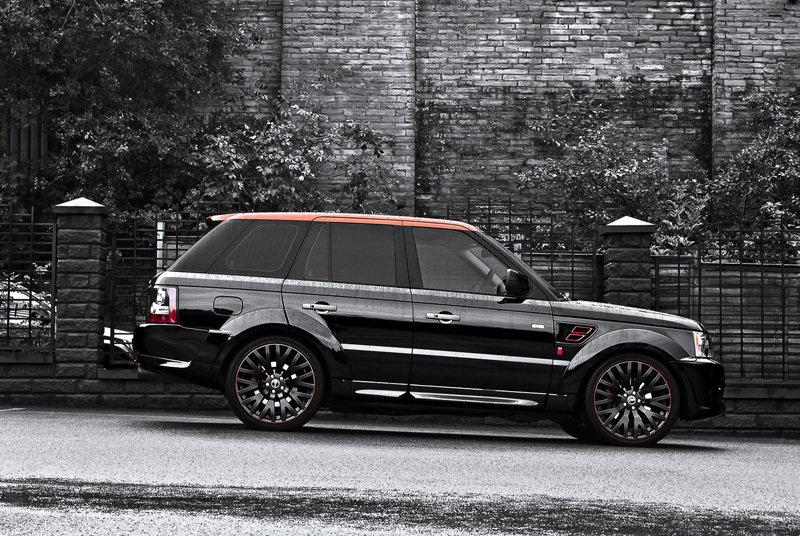 A Range Rover 3.0 SDV6 HSE with a streak of style. 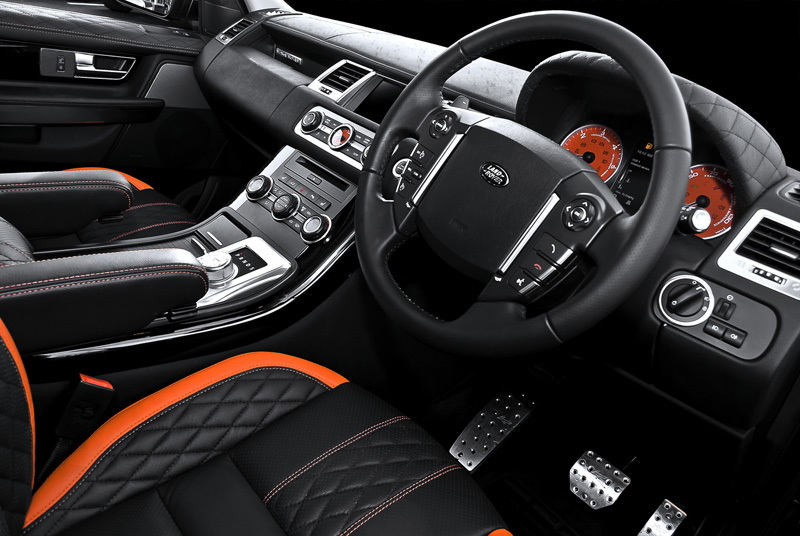 There’s something special about the Vesuvius Edition models from A Kahn Design. 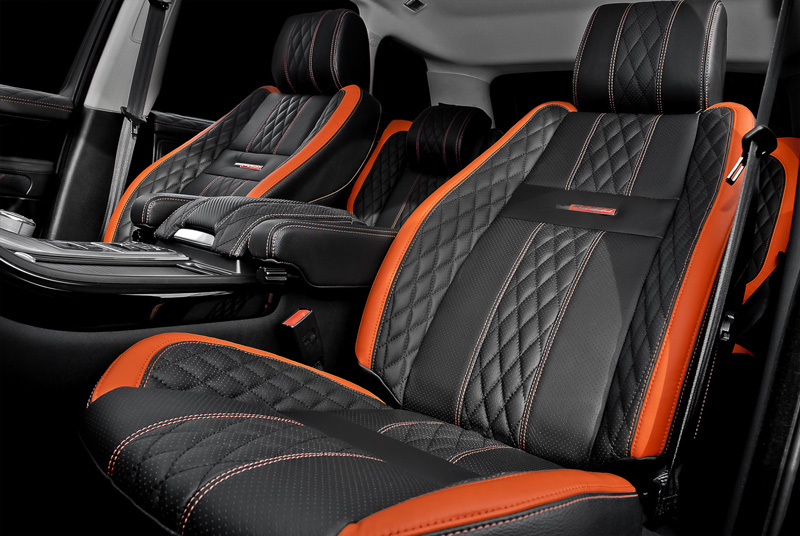 They’re dynamic orange and black examples of style and performance. The iconic orange color is featured throughout and adds a touch of flash to an already extravagant design. 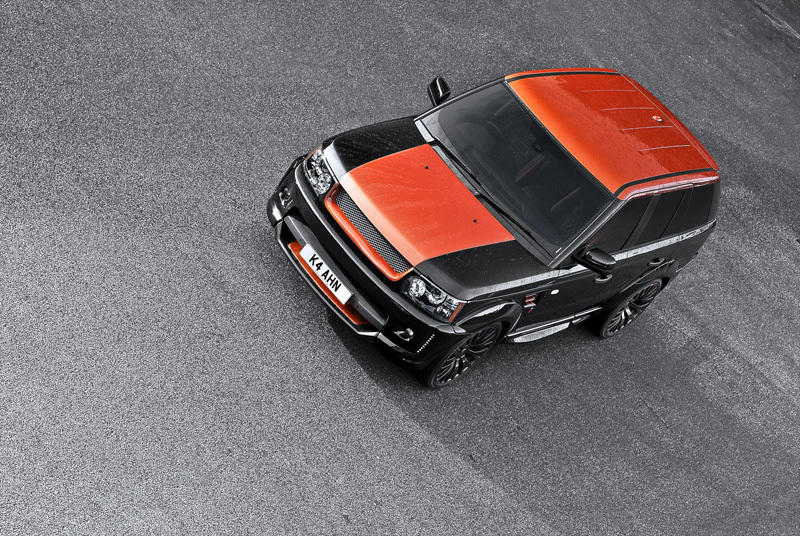 The latest model to undergo the orange and black styling treatment by A Kahn Design is the Range Rover 3.0 SDV6 HSE. The new RS300 Vesuvius Edition wears a new aerodynamically-optimized body kit and the special Santorini Black Metallic exterior paint with Vesuvius Orange highlights. 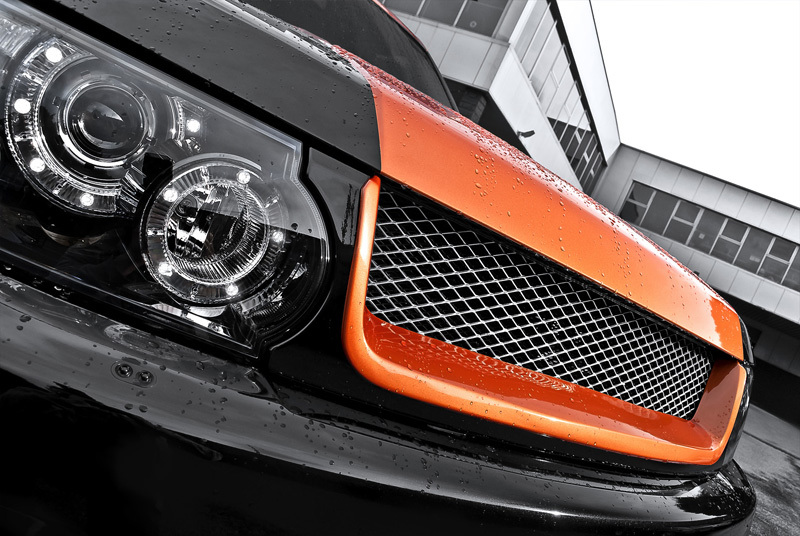 While much of the exterior is dressed in black the Vesuvius Orange paint is featured on unique highlights and across the hood and top of the SUV to create a “floating roof” effect. Then there’s the aerodynamic body kit that’s generates downforce and slices through air while looking good in the process. The front is comprised of a new lower bumper lip extension while the fascia wears an RS front grille with 3D mesh that stares ahead alongside each of the LED daytime running lights in the front fenders. The extended front wheel arches help to visually improve the muscular character of the RS300 Vesuvius Edition and incorporate new pearl grey air vents with Vesuvius Orange inserts and a Kahn shield. Rear RS wheel arch extensions and matte grey door handles round out the upgraded body components and give the SUV a more powerful appearance. 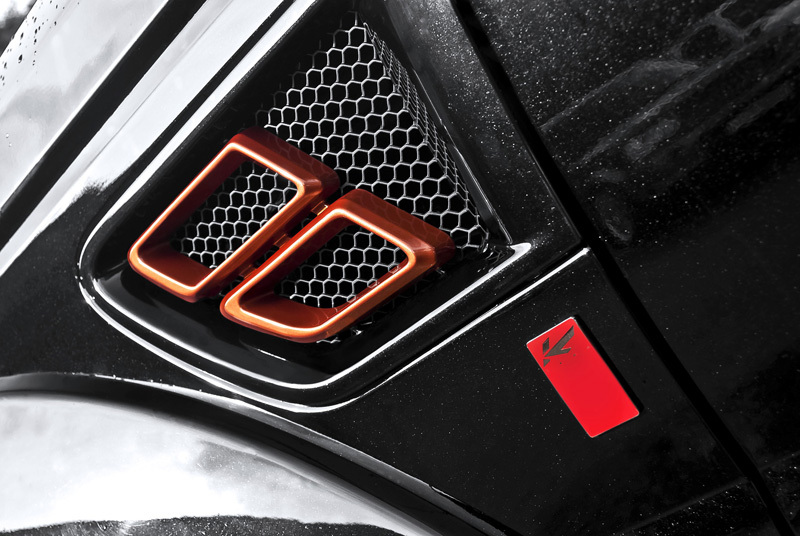 The diesel V-6 engine offers strong output to back up the athletic looks of the Kahn RS-style body kit. The oil-burner churns out 256 bhp at 4,000 RPM and 443 lb-ft. of meaty torque at just 2,000 RPM, aided in part to a stainless steel Kahn cross-hair exhaust system that emits a compelling roar. All of this power is sent to each of the four wheels thanks to a new buttery smooth ZF 8HP70 eight-speed gearbox for better performance and better fuel economy. 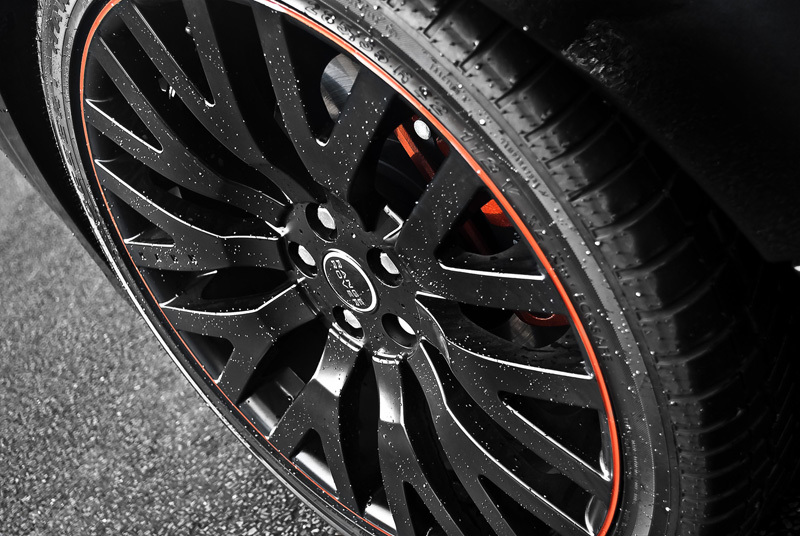 But those four wheels that are putting all that power to the pavement aren’t just the factory units; they’re custom-tailored Kahn RS wheels with a black finish and orange pinstripe with Vesuvius Orange brake calipers to match the color scheme. The design team opted for a more aggressive setup and installed the wheels in a 9.5 x 22 front and 10.5 x 22 rear setup with the rears featuring a slight concave design. The finishing touch is a luxurious interior redesign that offers comfort in all the right places. 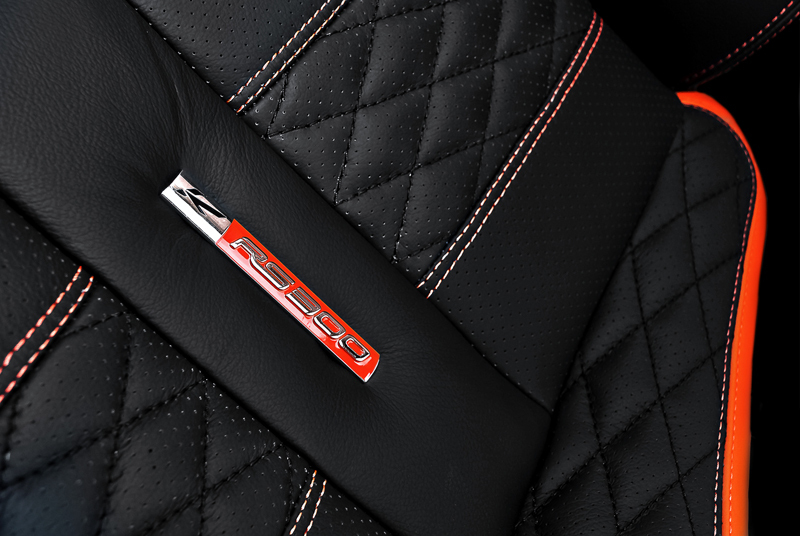 The entire seating arrangement was outfitted with RS Vesuvius diamond quilted and perforated black leather with orange stitching, accents, and Kahn RS300 logos. 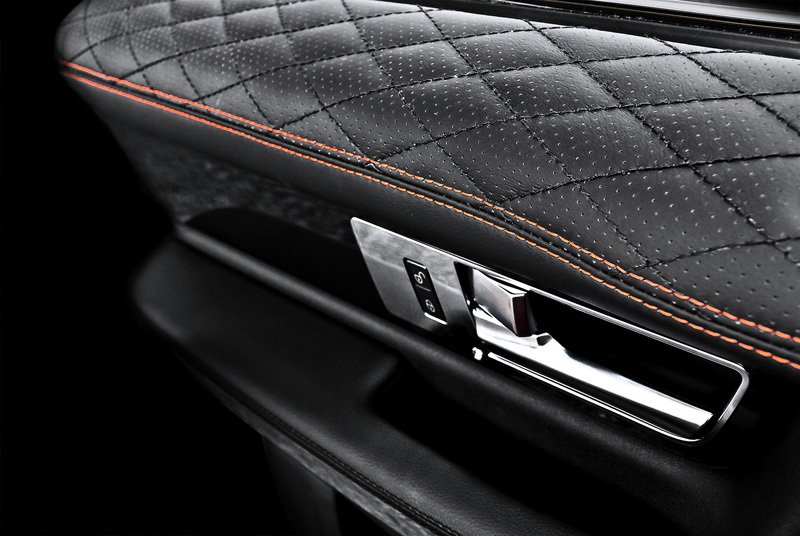 Even the door panel tops feature the same leather design combination. 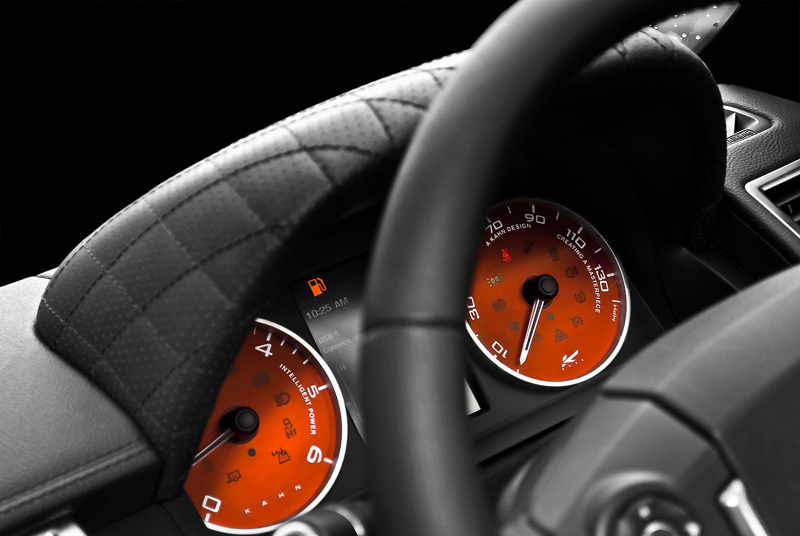 The instrument binnacle and dashboard wears quilted leather atop a quilted leather and carbon stripe. 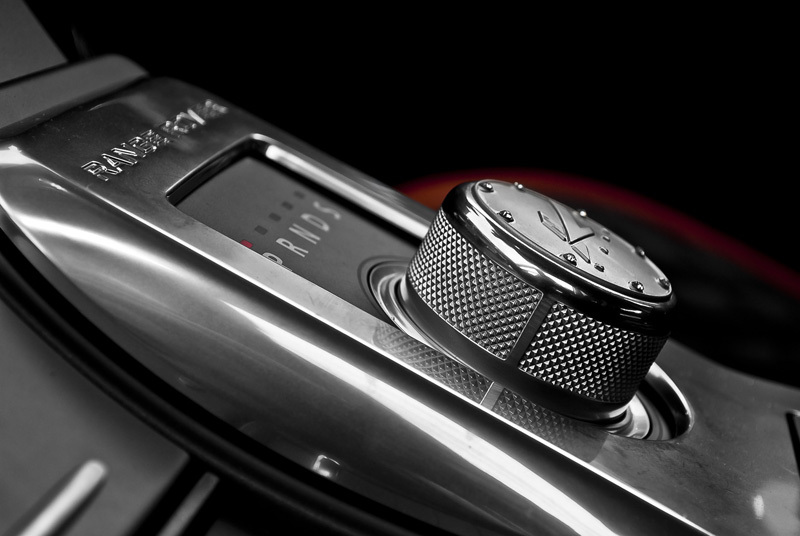 But at A Kahn Design, it’s all about the details. Two stainless steel illuminated door entry sills greet passengers and match the vented machined aluminum foot pedals. An orange clock with Swarovski diamond bezel is the centerpiece of the console and two Vesuvius Orange instruments hide underneath the quilted leather binnacle. Even the rear tailgate was finished with a 3D carbon finish. All of these upgrades are hidden from outside view thanks to special privacy tinted glass. 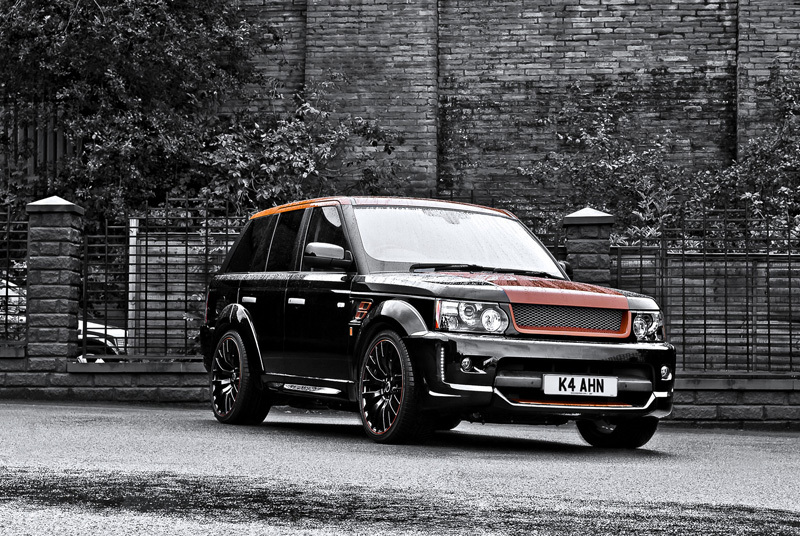 A Kahn Design is currently offering the new Range Rover 3.0 SDV6 HSE Range Rover Vesuvius RS300 as a complete vehicle. 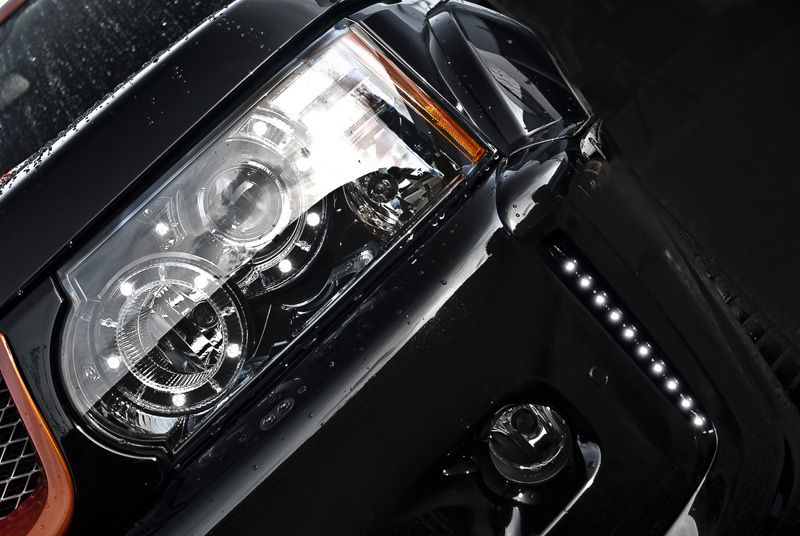 The team will design the entire SUV to customer specifications no matter what kind of color scheme or style. Pricing has not been released. 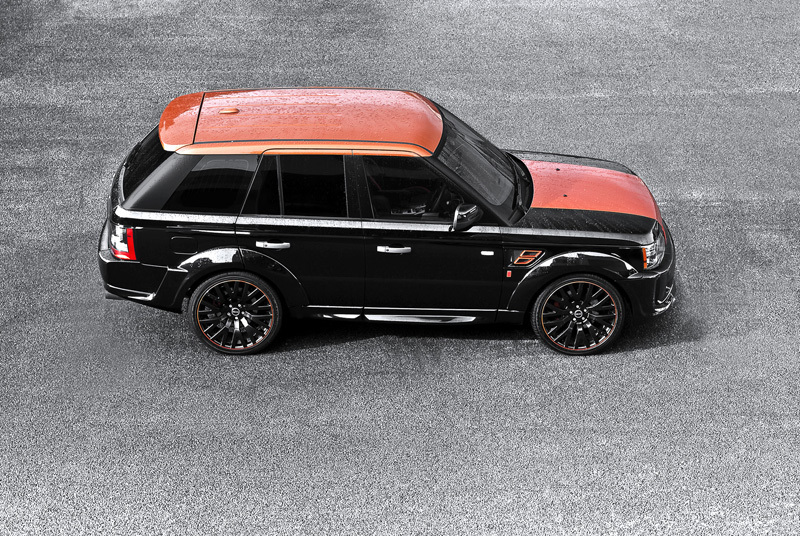 What do you think of the Vesuvius treatment on the new Range Rover 3.0 SDV6 HSE? Leave a comment and let us know! Have a Case of the Mondays? Some Ferrari 599XX EVO Video will cheer You Up!